Who are we? The European Wind Energy Association is a not-for-profit organisation representing the wind energy sector. For 30 years EWEA has been actively promoting wind energy. It now has 60 staff working full time on creating better prospects for the wind industry to develop. The growth of the association and its activities was made possible thanks to the support of over 750 EWEA members and the profit from EWEA events. The exciting growth of the wind industry has been accompanied by an increasing number of related events. So, whenever you consider education, networking or company visibility, be sure that you are making the right choices for the industry. EWEA has 20 years of experience in organising events that are customised to meet the industry’s needs and contribute to its further development. In addition, all profits from our events make EWEA’s policy and lobbying activities possible, so by investing in EWEA events you help ensure that the right regulatory framework is in place to enable the wind industry to continue to grow. Benefit from conferences of the highest standard, international exhibitions and incomparable networking opportunities, all under one roof while supporting the association’s work. ... innovating today, shaping tomorrow! See you in Amsterdam! Malgosia knows EWEA events inside out, as she has been working on its portfolio development for the last 7 years. She leads a team of 18 dedicated professionals. As 98% of all EWEA gross profit comes from events and membership, her team's performance determines how much EWEA can do for you. The 'beauty' of all EWEA income making activities is that all profit goes back to the association to enable further policy development. Meet us in Amsterdam! ... ... if efficiency is important for your job too, meet all your contacts in one place. See you in Amsterdam! Anja has been working at EWEA for the past 6 years. It is thanks to her dedicated team that EWEA events have gained the “premier” wind industry events label. ... Offshore is what I am passionate about. See you in Amsterdam! Anne-Bénédicte is EWEA’s offshore expert. She is working on making sure that what is decided at European level favours the development of your promising and innovative industry. It is thanks to her that EWEA members come together in a forum to discuss common problems and solutions which are key to offshore development. She hopes to see you in Amsterdam to share views on where you are and go back to the European institutions with your main messages. ... managing the European Wind Energy Technology Platform (TPWind). Filippo has been working at EWEA for the past 3 years. Thanks to his work, TPWind is now a key stakeholder in the EU energy policy framework, actively contributing to the allocation of national and EU funds for wind power R&D. ... making sure that our information reaches you. See you in Amsterdam! Iwona joined EWEA quite recently bringing with her the professional experience of big multinationals, EU institutions and think tanks. With her background in business, economics and EU affairs she aims to meet your expectations in the best possible way. ... bringing industry leaders together to debate the issues that matter. See you in Amsterdam! John joined EWEA’s Membership & Events department in 2009 and now manages the setup of conference programmes for EWEA’s ANNUAL and OFFSHORE events. In particular, John works on developing high-level panel sessions featuring leading political and industry figures. Join us in Amsterdam to hear what they have to say! ... gathering great minds in one place and enabling new ways for tomorrow's wind power to grow. See you in Amsterdam! Louise works in EWEA’s Membership & Events department and is in constant contact with chairs and speakers for the association’s bigger events. Louise is passionate about working for an organisation which makes a difference. ... supporting a dedicated team that makes all our events a great success! Maurice started at EWEA in March 2011 as Finance and Administration Director. Previously he worked for Truvo Corporate in Belgium and Telkom Directory Services in South Africa. Maurice and his family have lived in Belgium for 12 years. ... managing the creative work and coordinating video in Amsterdam to capture the moment! Raffaella joined EWEA nearly seven years ago and has witnessed the tremendous evolution of EWEA events. She is coordinating web and design activities, and project manages the production of EWEA communciation tools. ... making sure turbines are the only ones getting their feet wet! ... spreading the word. See you in Amsterdam! Tim has been working at EWEA for over 3 years and is responsible for the organisation's portfolio of workshops, debates and seminars. 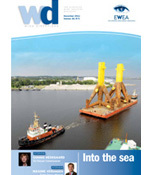 In addition to this he helps with the digital marketing of EWEA OFFSHORE 2011 and other events. ... updating the website and social media to keep everyone in Amsterdam informed. Tom arrived in EWEA in 2011. He manages the content on all of EWEA's many online platforms. ... securing European funds to develop offshore wind. Vilma has been working at EWEA since 2010. She is formulating and implementing targeted lobbying strategies to impact the political processes, ensuring the European wind industry maintains its technology leadership through increased public research funding (€1.3 billion target for 2014-2020). Her biggest achievement so far – for the first time ever the European Parliament has backed a dedicated budget line for wind energy R&D in the EU budget 2012. ... replicating the onshore wind energy success in the seas of Europe! Christian has been at EWEA since 2002 and CEO since 2006. The big boss drafts EWEA's vision and long-term strategy and is responsible for their implementation. He represents the association in a wide range of external contexts. ... communicating all you need to know. See you in Amsterdam! Deborah is one of the team’s newest members. She is passionate about helping to increase the profile of wind energy in order to achieve a more sustainable and cleaner energy future. Working with her colleagues in EWEA’s Membership & Events department, she aims to keep you up to date with the latest on EWEA events. ... making sure the finance is there for a fabulous event. See you in Amsterdam! Benoît manages the financial and tax issues related to EWEA and all its activities including events. He started at EWEA in September 2009 after a career of 14 years in the automotive sector as accountant and financial controller. Benoît is Belgian and enjoys the joy and enthusiasm of his three kids together with his lovely wife. ... 400 heads are better than one! See for yourself in Amsterdam! Amy has been working on EWEA’s conferences since 2007 and now oversees their execution and strategic development. 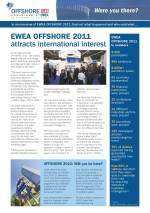 The EWEA OFFSHORE 2011 conference took a year to develop, with the support of 150 experts, and brings together over 400 oral and poster presenters. Amy enjoys the challenges that large events bring (and finding creative solutions to them!) and is always looking for ways to include new people, ideas and innovations in the conference. ... working with national associations to deliver on our 2020 objectives and beyond. Pierre Tardieu joined EWEA in May 2011. He is in charge of coordinating EWEA’s national associations’ network and focuses in particular on the effective implementation of the Renewable Energy Directive at national level. Pierre is also in charge of EWEA’s trade policy covering issues ranging from bilateral Free Trade Agreements to raw materials access. ... making sure that the right stand is booked for you. Looking forward to meeting you in Amsterdam!! Iga has been working at EWEA since July 2010. She deals with membership, advertising in Wind Directions and exhibitions. Generating offshore wind power is certainly interesting: transmitting it to consumers onshore for me is the fun part! Iván has recently joined EWEA as an expert researcher on electricity grids and market. Building on his engineering background, he will deliver important technical studies on grid infrastructure, technologies and market design that enable large-scale wind power penetration in Europe. ... registering as many participants as possible! See you in Amsterdam! Maura joined EWEA in March 2011. She supports the Events Department to help her team run smoothly! Maura also deals with registrations and ensures that all free delegates get their badges! ... making sure all the leading companies in offshore wind will be there. See you in Amsterdam! Christelle joined EWEA in 2010 and is in charge of promoting EWEA events to exhibitors, sponsors, conference delegates and exhibition visitors. Together with her dedicated team, she makes sure that all participants meet their business expectations when attending EWEA events and that industry leaders consider EWEA events as the premier wind energy events in Europe. ... making everything look perfect. See you in Amsterdam! Since the day he joined EWEA three years ago, Jesús has been bringing new ideas to the association with the goal of promoting the wind energy industry. His work ranges from communication campaigns to the design of reports and event marketing material. He is also responsible for EWEA's corporate identity. ... bringing 460 exhibiting companies together on the world's largest offshore exhibition floor. See you soon in Amsterdam! Sanna has been working at EWEA since January 2008. She is responsible for sales and development of the EWEA exhibitions. She enjoys being in contact with EWEA members, exhibitors and sponsors, and together with her colleagues, aims to ensure that the exhibitors attending EWEA Events will achieve the maximum return on investment. ... focusing on innovation in offshore wind technology. See you in Amsterdam! Athanasia has worked with EWEA for the last 2 years as a research officer on the cost of wind energy and the technology development of offshore wind power in Europe. ... bringing visibility and fun to sponsors looking to grow their offshore business. See you in Amsterdam! Christi has been working with EWEA members and sponsors since 2008. Her work with EWEA sponsors and her colleagues will ensure that all participants will enjoy the many networking opportunties EWEA has to offer. Paul represents EWEA to an external audience on grid and internal market issues. ... making sure exhibitors are happy. See you in Amsterdam! Aleksandra joined EWEA in January 2010. She is coordinating exhibition logistics and putting together the exhibitor manual. She enjoys chatting on Skype with exhibitors and helping them with the preparations to the event. ... supplying journalists with all they need. See you in Amsterdam! Peter has been working at EWEA since August 2010. He supplies journalists across the EU and the world with EWEA's latest news, responds to their requests and monitors media publications concerning energy policy. As a former EU correspondent he likes supplying journalists with news, details and facts. ... providing the best framework for companies and making all participants feel welcome. See you in Amsterdam! Célia joined EWEA nine months ago and is responsible for the logistics of EWEA OFFSHORE 2011 and EWEA Annual Events. She enjoys finding creative solutions to improve the quality of the events and each participant's experience. Managing EWEA websites and photography. If you see me in Amsterdam smile! Jason has been with EWEA since September 2008 and enjoys the challenge of managing EWEA's complex web infrastucture. His favourite activity is finding solutions to web problems for his colleagues. His passion for photography has spilled over into his work, and he now manages EWEA's photo strategy as well. ... making our networking events work for you. See you in Amsterdam! Frédérique has been working at EWEA since November 2008. She is responsible for many of logistical aspects of EWEA events, in particular the many networking events. Combining prestigious venues, unforgettable entertainment and high-profile audiences, these events are always memorable, enjoyable and time well spent. Don't miss out – see you in Amsterdam! ... directing EWEA's work to promote the offshore wind industry to Europe's policy-makers. ... ensuring human approach to technical aspects. Nathalie joined EWEA in January 2010. She is initiating and implementing HR processes and projects. She serves as point of liaison between EWEA management and staff, provides coaching to senior management for all HR related matters and is responsible for compensation and benefits. ... bringing you news live from the event on our blog! Zoë joined EWEA in 2009. She communicates the benefits of wind energy to a wide and energy interested audience in particular on the EWEA blog. 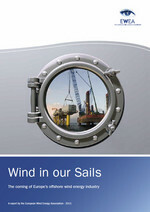 Register now and join us at EWEA OFFSHORE 2011, or see other upcoming EWEA events.